100 years ago today, during the afternoon of Tuesday 27th August 1918, the Lifford Memorial Hall in the Cotswold village of Broadway was full to capacity for an afternoon of music and drama arranged by Mary Anderson de Navarro in aid of the Fund for the Relief of Belgian Artists. The relief fund was established to ensure that individuals and families who remained in Belgium during the First World War would receive money but it also ensured that those who had sought refuge in the United Kingdom would be well looked after. The event was arranged by the ‘celebrity’ American stage actress and Broadway resident, Mary Anderson de Navarro. 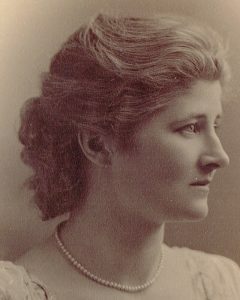 During the First World War, Mary Anderson carried out a number of fund-raising performances in London, Stratford-upon-Avon, Worcester and Evesham and this performance of Macbeth in Broadway met with great acclaim. Fellow American opera singer Murray-Davey (who lived at Willersey House in the nearby village of Willersey) helped organise the event. The first half included performances of Ede Poldini’s La poupée valsante and Ange Flegier’s Le Cor and pieces by Brahms and Bach performed by a string quartet; Messrs. Désiré Defauw, Lionel Tertis, Emile Dochard and Harold Samuel. Instrumentalists included Lady Sykes and Lady Maud Bowes-Lyon (also a resident of Broadway and Aunt of HRH Queen Elizabeth The Queen Mother). The second half included scenes from Macbeth with Mary Anderson as Lady Macbeth and the American Shakespearean actor Edward Hugh Sothern, who specialised in dashing, romantic leading roles, as Macbeth. They were supported by Miss Hare, Shakespearean actor and director Sir Philip Barling ‘Ben’ Greet, Mary’s son Lieut. ‘Toty’ de Navarro and the English actor Sir John Hare. Broadway was fashionable amongst artists at the time and had been since the late 1880s when the sleepy picturesque Cotswold village had attracted a number of English and American artists, writers, painters, musicians (the ‘Broadway Colony’). John Singer Sargent, Francis Millet, Edwin Austin Abbey, Alfred Parsons and Henry James (to name just a few) gave Broadway its artistic heritage that visitors today continue to enjoy and is celebrated biennially by the Broadway Arts Festival. Debbie and her family moved to Broadway from Hertfordshire in 2006 and run Broadway Manor Cottages holiday cottages and apartment from their 16th century home on the outskirts of the village. This summer sees the 5th Broadway Arts Festival which will take place in the village from 8th to 17th June 2018. For more information about our Cotswold holiday cottages and apartment at The Manor House, Broadway, click here. 2018 is packed with a wide range of events in the Cotswolds for all the family. There is plenty going on in the Cotswolds throughout the year. Ranging from world famous international festivals like the Cheltenham Festivals in Cheltenham Spa which include the Science, Literature and Music Festivals and Cheltenham Gold Cup Week at Cheltenham Racecourse, to quirky events like the Cotswold Olimpick Games at Dover’s Hill or Tetbury Wool Sack Races. Major musical events also include the Wilderness Festival, Longborough Festival Opera, Cornbury Festival or the Big Feastival, as well as many other events featuring food, music, exhibitions, arts and literature festivals and theatrical productions. Not to be missed in Broadway is the 2018 Broadway Arts Festival in June! The festival season in Cheltenham kicks off in March with the jump racing and the excitement of Gold Cup Day. Easter sees the opening of Broadway Station and steam trains returning to Broadway and ‘Easter Eggspress’ trains. Families can enjoy Easter egg hunts at many Cotswolds’ attractions including Newark Park, Wootton-under-Edge. Badminton Horse Trials and Cheltenham Jazz Festival are some of the largest festivals taking place in the spring. Quirky Cotswolds events include the famous Cheese Rolling at Cooper’s Hill and the Tetbury Woolsack Races both taking place on 28th May 2018. Broadway Arts Festival celebrating the village’s artistic heritage takes place from 8th – 17th June 2018. Families will also enjoy the Times Science Festival in Cheltenham and the Wychwood Music Festival. Look out for magical Giffords Circus as it travels its way around the Cotswolds. Giffords will be performing in nearby Winchcombe from 17th – 21st May. Other key events include the The Cotswolds Show in Cirencester, The Three Counties Show near Malvern, Tewkesbury Medieval Festival, Longborough Festival Opera and the Royal International Air Tattoo at Fairford. Heritage Days in the Cotswolds see some attractions, not normally open to the public, open their doors. The brilliant leaf colours of Westonbirt Arboretum and nearby Batsford Arboretum amaze. The Times and The Sunday Times Cheltenham Literature Festival is the flagship festival of the autumn. During the winter months you’ll find carpets of snowdrops at Painswick Rococo Gardens, Colesbourne and Newark Park. The Cheltenham Folk Festival and Gloucester Cajun & Zydeco Festival add a touch of spice to the proceedings. Christmas Late Night Shopping Evenings take place in Broadway the last Friday in November and the first Friday of December. Christmas markets appear in towns and villages such as Cheltenham, Cirencester and Gloucester. Westonbirt Arboretum lights up its acres of trees for Enchanted Christmas. Inside our Cotswold holiday cottages and on-site information room you’ll find a wide selection of leaflets, books and other information to help you make the most of your stay in Broadway and the Cotswolds. The Broadway Arts Festival 2018 will be taking place in and around the village of Broadway from 8th to 17th June 2018. The beautiful Cotswold village of Broadway is a renowned centre for the arts with a unique artistic heritage of a world famous colony of artists the ‘Broadway Colony’. The Broadway Colony was a group of American artists, writers and musicians who visited and worked in Broadway in the late 19th century. The Broadway Arts Festival during June 2018 will offer a huge selection of events for all the family including: celebrity talks, art workshops and demonstrations, art exhibitions including an open art exhibition, a WW1 Exhibition, music including a ‘Come & Sing’ choral workshop, and theatre of the highest quality. Broadway Artbeat Weekend will take place during the first week of the Festival from 8th-10th June – an exciting weekend event featuring artists and craftsmen demonstrating their skills, with specialist demonstrations led by some of the country’s most renowned contemporary artists. During the evening of 14th June, Heartbreak Productions will be bringing romance to the village with their performance of ‘Pride and Prejudice’ in a tent on the village green. Sir Roy Strong CH FRSL, Patron of the Festival, in conversation with Tristram Hunt, the current Director of the V&A. Richard Ormond the grandson of Violet Sargent Ormond, sister of John Singer Sargent. Richard, historical advisor to the Festival, will be giving a talk on the Art and Adventures of John Singer Sargent. John Julius Norwich (2nd Viscount Norwich CVO) who will be giving a talk on his latest book The Art of France. Leading art critic Andrew Graham Dixon. Artist, writer and broadcaster Lachlan Goudie who recently present the BBC’s Big Painting Challenge. Author Guy Fraser Sampson whose books include the Mapp and Lucia series. Violinist and composer Ben Powell in concert. Award-winning author Donna M. Lucey whose works include the bestselling Archie and Amelie: Love and Madness in the Gilded Age and Sargent’s Women. Tickets for Broadway Arts Festival events this June will be on sale later in the year – more information about the Broadway Arts Festival 2018 can be found at: www.broadwayartsfestival.com. Our Cotswold holiday cottages on West End are just a few minutes’ walk from the centre of the village. Our self-catering holiday cottages are an ideal location to stay whilst visiting the Festival. For more information about our cottages in Broadway visit www.broadwaymanor.co.uk. My interest in gardening grew after obtaining an RHS Certificate in Horticulture which then led me to a qualification in Garden Design in 2005. During my studies I studied many great British garden designers including Alfred Parsons, Gertrude Jekyll (who was famous for her herbaceous borders and greatly influenced by the Arts & Crafts Movement), Sir Geoffrey Jellicoe, landscaper Lancelot ‘Capability’ Brown and Rosemary Verey to name a few. I was also fortunate to visit many of the gardens which were originally designed by these great designers, many of which are located in the Cotswolds. I now live in the picturesque village of Broadway in the North Cotswolds which was also home to Alfred Parsons in the late 19th century. Alfred William Parsons, English landscape painter, watercolourist and illustrator was born on 2nd December 1847 in Laverton near Frome, Somerset. Alfred was the second of seventeen children of Dr Joshua Parsons and Letitia Harriet Parsons (née Williams). His father was a doctor with a keen interest in growing alpines which no doubt sparked Alfred’s early interest in plants and gardening. Although Parsons started work in 1865 as a clerk in the Post Office after 2 years he left to pursue studies at the Kensington School of Art. Parsons. went on to become well known as a fine botanical painter, engraver and painter of English rural landscapes exhibiting at various galleries including the Royal Academy (1887), the Grosvenor and the New Gallery. Whilst living in London, Parsons shared his home with Edwin Austin Abbey and they painted alongside each other in adjacent studios. Parsons was introduced to Broadway by his friend Lawrence Dutton who was a frequent visitor to Broadway Tower, the holiday retreat of William Morris, Dante Rosetti and Edward Burne-Jones. Parsons was so taken with the village that he decided to move out of London joining the Broadway colony of artists in residence in Broadway in the late 1880s. 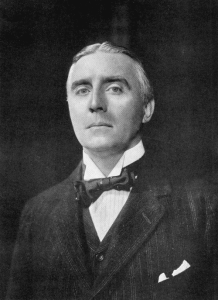 Parsons became a good friend of both John Singer Sargent and Francis Davis Millet (Frank and Elizabeth Millet named their youngest son John Alfred Parsons Millet after both Parsons and Sargent) and introduced Abbey to the Broadway colony. Parsons also met Henry Harper through the Broadway Colony which led to him illustrating several editions of Harper’s New Monthly Magazine (Harper’s Magazine). Parsons also worked with his good friend Abbey on illustrations of Robert Herrick’s poems and supplied illustrations for Henry James’ essays on Broadway. He also illustrated songs, poems as well as travelogues. Parsons’ fine watercolours for botanist Ellen Ann Willmott and illustrations for William Robinson, author of The Wild Garden, encouraged Parsons interest and passion in garden design. Parsons had always been an avid gardener and horticulturist and was once a judge at the Chelsea flower show. Parsons went on to design several great gardens including Great Chalfield Manor, an Arts and Crafts garden near Melksham, Wightwick Manor near Wolverhampton and Lamb House, Rye, home of Henry James from 1898 to 1916. Parsons also designed several gardens in Broadway including Court Farm, home of Mary Anderson (Mme de Navarro), Broadway Court with its wonderful yew topiary, Bell Farm, home of the pianist and composer Miss Maud Valerie White and eventually his own at Luggershill. Parsons became President of the Society of Painters in Water Colour in 1905 and full RA in 1911 on the acceptance of his diploma work, the oil painting Orange Lilies which Parsons painted in his back garden at Luggershill. Orange Lilies was on public display in the ‘Exhibition of the work of John Singer Sargent and members of the Broadway Colony’ at Trinity House, Broadway, during the 2010 Broadway Arts Festival. Parsons died at Luggershill (now known as Luggers Hall), Broadway, Worcestershire, on 16th January 1920. The next Broadway Arts Festival will take place from 8th – 17th June 2018 and will offer a varied schedule of events including talks, art workshops, demonstrations and exhibitions, music and theatre. The village is a centre for the arts with its unique heritage of the world-famous colony of American artists, writers and musicians – the Broadway Colony. If you are interested in staying in Broadway during the 2018 Festival please visit our Cotswold holiday cottages in Broadway, just a few minutes’ walk from the centre of the village.